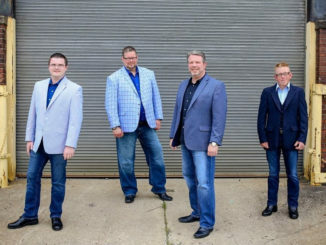 GloryWay Quartet was formed in 2002 and hail from Mansfield, Ohio. They travel some 200 dates a year spreading the gospel in song. They have shared the stage with some of the top southern gospel groups as well as performed on the National Quartet Convention showcases over the years and were the showcase winners of the 2016 American Gospel Celebration hosted by Pastor John Hagee. The group today consists of owner and lead singer, Justin Crank; tenor Bryan Langley, baritone John Cole and bass Justin Sayger. 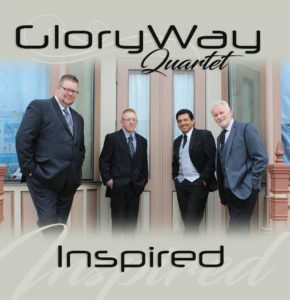 GloryWay Quartet’s latest project, Inspired, is their 10th project. It features a variety of songs, from hymns to a few classic songs to others that you are familiar with. Starting the project off is a peppy classic one “I Saw The Light.” “God On The Mountain” is one that was made popular by the McKameys and is a favorite for all. For those who like bass singing, “Turn Your Back” is one that you are gonna love. A song that I used to love to sing in my youth group “Get All Excited” brought back some great memories for me. We need to be excited and go tell everyone about Jesus! Probably one of the most famous hymns “Amazing Grace” will have you singing right along. Kicking back up is another peppy and familiar one. “Try A Little Kindness” is a song that the whole world needs to hear today more than ever. Several classic ones include “Great Getting Up Morning,” “Old Gospel Ship,” and “The Lighthouse.” Another great one, “Though It All,” will have you praising the Lord for His goodness and grace. Rounding out this project is “No Hill For A Climber” which is a peppy, hand clapping, toe tapping, foot stomping one. You will definitely be singing along to this one as well. The song selections make up a great mixture for listening and you will enjoy singing right along since most every song on here is a familiar one.